Discovering Google search volumes for any given phrase is a notoriously difficult task. 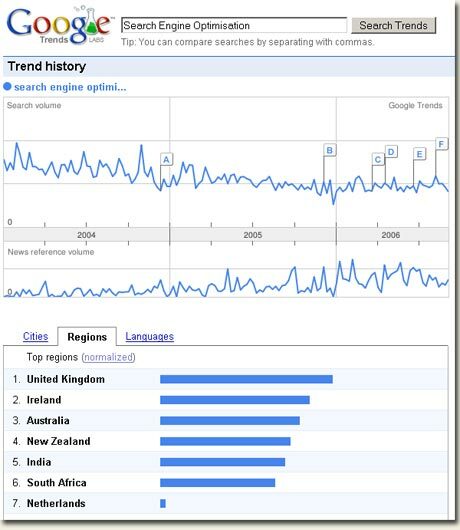 Google offers a number of tools to their Adsense and Adwords customers, and Google Trends delivers a graphical representation (without absolute figures) for search volumes mapped against press coverage. Interestingly, while news coverage seems to have increased, the search volume for ‘search engine optimisation’ has been steadily decreasing. Yes bad press for sure thanks to the SEO cowboys but I would also tend to believe that PPC services such as Adwords has a part to play. Many companies out there choose PPC over SEO (if they have the budget). One company I worked with (in the U.S.) ranked nowhere for their main key terms but used had a very large budget to throw at Adwords. There was some interesting out over the past week that analysed the conversion rates for both SEO and SEM on B2B sites and PPC was only just slightly more effective than conversion from organic SERPs. I don’t recall seeing anything about the relative costs, but it sure would be interesting to look at the ROI on both SEO and SEM individually.